It wasn’t too long ago that you’d have to pick up your phone any time you needed to ask a question as a consumer. Whether it was a billing inquiry, product return, or general support question, if you wanted any help, you needed to call in. Period. Today, you can initiate contact with companies in a number of ways — chat, email, and even social media. Non-phone support is so popular, that many new companies and startups don’t even have call-in options or 1-800 numbers displayed on their contact page. And this is good news if you’re looking for non-phone jobs in customer service as more and more companies turn to virtual teams to support their customers via email. GitHub is where people go when they want to collaborate with others to build software. In other words, it’s the place to share code. Users can host and manage their code on GitHub and either keep it private or share it with others. Everyone from newbies to pros can use GitHub to simplify the software building process. And because there are literally millions of GitHub users and an equal number of open source projects hosted here, there’s also the need for a ton of support — that’s where the email support jobs come in. Email support jobs at GitHub range from Account Support to Tech Support and even Terms of Service Support. Depending on your background, you might find one of the positions to be a better fit than the others. In addition to helping GitHub users while working remotely, you’ll also receive some pretty awesome benefits like 100% healthcare coverage for you and your family and stock options. Meet Edgar is making it easier for bloggers and businesses to fill their social media calendars. In fact, it’s the only social media automation tool that actually fills your social queue for you — how’s that for convenience? Plus, Edgar makes scheduling smarter and gets social updates seen by more people. It really is a great tool that saves time, energy and effort all while helping businesses and brands grow their social presence. It’s no wonder so many people are singing Edgar’s praises across social media! And with so many loyal users and more joining each month, there’s a growing need for support at this fully-distributed company. Keep your eye on the Edgar Career Page to see what positions are currently available. While not always hiring, they are, from time to time, looking for part-time email reps to help welcome new subscribers on board and answer any questions users may have. OkCupid is the self-proclaimed “best dating site on Earth.” Users can sign up for free, complete a quick 2-minute profile and — voila — the OkCupid algorithm matches people up. It’s just that simple. While it’s free to sign up, users can also upgrade their accounts to access special perks like incognito browsing, message filtering, and ad-free browsing. And with more than 1 million app installs and a whopping 7.3 million messages sent through OkCupid each day, there’s a whole lot of need for user support. So much so, that OkCupid frequently hires email support reps to join their team! You’ll want to visit the OkCupid Hiring Page to see if they’re currently hiring for their email support role. It’s important to note, while the job is mostly interacting with users via email, you may, on occasion, need to make a phone call when there’s a particularly tricky support or billing question that needs to be resolved! The Yeomen is a growth management company. That is, they provide consulting and support staffing to businesses who need help managing their help desk. For example, one of the companies The Yeomen teams with to provide support is Vimeo. The Yeomen provides a team of support ninjas to engage with Vimeo users on a daily basis, answer questions, and generally help build an active community of happy users. And since many of the services The Yeomen provides is support-oriented, they’re often hiring email reps to join their team. The type of work and number of jobs available will depend on the particular company The Yeomen has partnered with. So be sure to check in with their Careers Page frequently to see what positions are currently available! Clara is a virtual employee professionals add to their email accounts. That’s when Clara gets to work scheduling appointments and setting meetings, freeing up valuable time for the busy professional. When you work for Clara, you become the human element behind artificial intelligence. But since artificial intelligence isn’t perfect (at least not yet) Clara needs the help of remote representatives to process emails. While this is a remote email support job, you will need to be available to process emails during their peak times (9-5 PST). Clara isn’t always hiring — so make sure you visit their About Us Page to see their current openings (about halfway down). You might not recognize the company name Automattic but you’re probably familiar with their products — WordPress, Akismet, and WooCommerce are just a few of the well-known platforms and plugins created by Automattic. When WordPress users need help with various Automattic creations, they start a support ticket. From there an email support rep gets to work helping users with everything from complicated code issues to pre-sales questions. So being an active WordPress user is a definite plus when applying here as is previous experience providing remote support. Check out their Work With Us page to see what’s available — you can find a variety of email support jobs here like Happiness Engineer and Theme Wrangler! Ibotta is the app to use if you want to earn cash back for your everyday purchases. Before you go shopping, simply see what offers are available and, once you’ve made a qualifying purchase, you can redeem your rebate. All you need to do is scan product bar codes and upload a photo of your receipt. Ibotta reviews your receipt, verifies your purchases, and will credit your account in just 24 hours. Once you’ve hit $20, you can request your earnings be transferred to your Paypal account. To date, Ibotta users have earned more than $110 million in cash rewards. And to help process all those receipts and rebates, Ibotta uses email support reps. While this is a remote position, candidates must be local to Denver, CO for training and team meetings! Head on over to their Careers Page to if you’re a Denver resident and interested in this email support job. Zapier connects the web apps you love to make them even better!. This makes it possible to automate tedious tasks, freeing up more time to work on things that matter the most! With more than 500 apps users can combine to create workflows and automated sequences, called Zaps, there’s an opportunity for a lot of questions. And while Zapier does a great job addressing many of these FAQs in their learning center, they also regularly hire Customer Champions to help teach others how to optimize their work. Build databases with ease and without writing a single line of code when you use Knack. With Knack, users can quickly create databases using templates or create their own from scratch — bringing the power of databases to all business. There are seemingly endless ways for Knack users to build their own databases. From maps and reports to E-commerce and calendars, Knack gives users a ton of amazing business-boosting options. To help them make the most of the tools available to them, Knack hires remote Customer Success reps. This position is available to candidates across the U.S. and is perfect for anyone who enjoys helping customers “translate their business needs into awesome app.s” If this sounds like you, go check out the job description to learn how you can apply to join the Knack team offering email support. TED brings short, powerful, and inspirational ‘talks’ on all things involving technology, entertainment, and design. If you’ve never watched TED talks before, there are currently more than 2,200 in their library for you to choose from — you’re bound to find something that piques your curiosity. As an award-winning company whose talks have been viewed more than a billion times, there’s definitely a large and loyal audience of TED talks followers who interact with the company on a daily basis. And Customer Support Specialists at TED are there to lend these users a helping hand and address their needs. This position is part of the tech team, so you’ll need to be able to respond to support issues, flag bugs, and evaluate and improve existing systems. Think you have what it takes to join the TED team as an email support rep? Head on over to their Careers Page to see is they’re currently hiring. Buffer is one of my personal favorite social media automation tools. And I’m not alone — more than 1,000,000 people (and rapidly growing) turn to Buffer to help schedule posts for their Twitter, LinkedIn, Facebook and Google+ profiles. The Buffer team is a fully distributed one which means if you join them, you get to work from the place you work best — home, coworking spaces, coffee shops, wherever really. You’ll also get some notable benefits and have freedom and flexibility in how and when you work. A number of their positions, like Customer Champion and Happiness Hero, involve email support. Visit their Journey Page to see current open roles. While these 11 companies frequently hire email support reps to tackle customer service, they’re not the only companies that rely on virtual team members to assist users. Make sure you search Indeed Jobs where I frequently come across smaller companies needing a little email support assistance. If you’ve got an entrepreneurial spirit, you can always create your own email support job — and it’s easier than you might think. For starters, you can sign up for an account on Upwork and start submitting proposals to clients needing reps like you. Or if you want to make your business all about answering emails for busy entrepreneurs, bloggers, and other email-swamped pros, check out the e-book: Answering Emails for Money . While email support jobs options are out there, they’re not as readily available as other work from home jobs. If you like the idea of working remotely offering support, consider becoming a virtual assistant (VA). Although being a virtual assistant might require you to pick up the phone on occasion to schedule an appointment or make an inquiry, the majority of work is performed over email. If being a VA sounds like it could work for you, this beginner’s guide will answer many of the questions you might have and give you leads on where to find work. I’m here to help! Leave your questions in the comments below or send me an email directly ashlee(at)workfromhomehappiness(dot)com — I’m here to help! 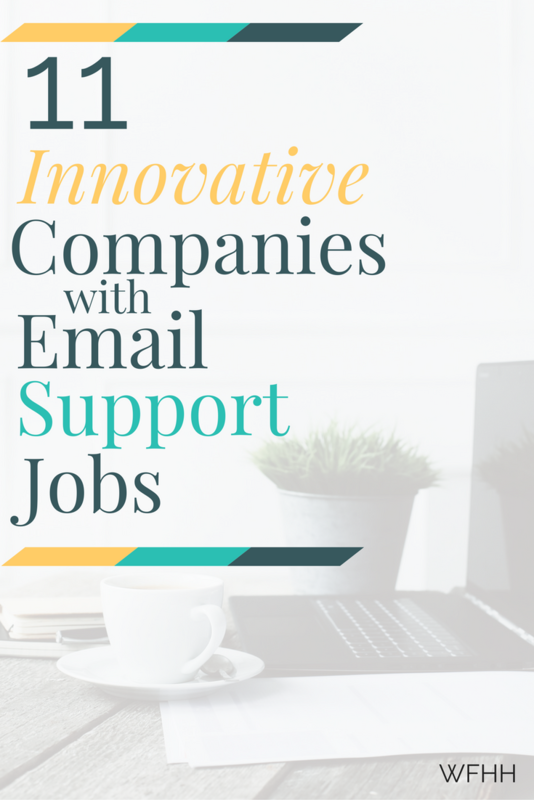 The post 11 Innovative Companies with Email Support Jobs appeared first on Work from Home Happiness.